Imagine explaining to space aliens that, once a year, here in NYC and around the country, millions of Americans crowd into parks to to oooh and ahhh at 4th of July fireworks festivities. “EEp osHðö mii Elop,” they’d say, which translates, loosely, to “Lol, you’re celebrating this situation?” (It sounds much better in alien.) But, sometimes it’s heartening to take a break and reflect on the best moments of US history, you’d tell them, resisting the urge to snap a pic and sell it to the tabs so you can finally blow this popsicle stand once and for all. Sky sparklies are magical -- you just need to find the right time and place to watch them. And you can see the bombs bursting in air on the Fourth of July anywhere with East River views between 23rd Street and 42nd Street in Manhattan and from select Brooklyn spots. 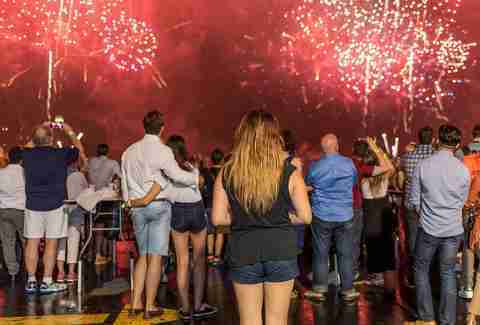 Fireworks during Wednesday’s main event will be visible from several locations throughout the city, and catching them will require a little coordination, a little luck, and a lot of crowd tolerance. 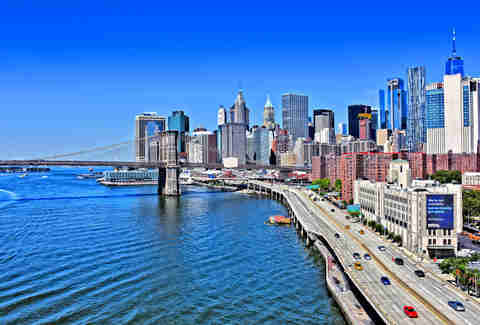 Official viewing locations (read: great view, huge crowds) are along the East River at 42nd Street and FDR Drive, 34th Street and FDR Drive, 23rd Street and FDR Drive, 18th Street and Avenue C, and Houston Street and FDR Drive. Squeeze in near any of the sanctioned spots and you’ll see at least some of the 75,000-shell display. Just avoid road travel getting there -- some streets will be closed to accommodate the citywide show. The subway will operate on a saturday schedule, but always make room for service changes from your friends at the MTA. And you could watch live on TV or your mobile device, but that’s not what you’re here for. You’re here to choose from the best rooftop bars, parks, and waterfront areas to catch the light show -- and down liquor in the name of America. Aliens welcome. Home to Danny Meyer’s latest venture -- an affordable taco stand called Tacocina -- Domino Park has already become a summer destination for North Brooklyn imbibers. Beyond skyline views, the refurbished spot has a dog run, a bocce court, beach volleyball, and naturally, ample tables and chairs for sucking down margaritas and grilled pork tacos. Stake out a spot on the elevated walkway for firework views. East River State Park’s sparkly Manhattan views are bolstered by the fireworks display. Picnic tables are scattered about a sprawling lawn, making it the perfect place to bring large groups and every Lays potato chip flavor. Think pickup soccer, picnic spreads, and a gorgeous sunset over the East River. Capacity is just 6,000, so show up early. This is Manhattan’s southernmost free, official, corporate sponsor-sanctioned fireworks show entry point. Expect crowds no matter how early you arrive, clandestine alcohol-snatching security, no bathrooms, and a sea of true firework devotees. 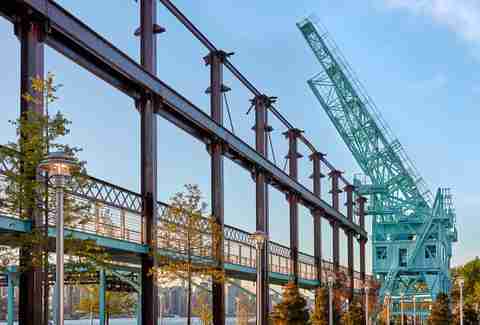 This 12-acre riverside stretch in Queens is directly across from the central fireworks launch point. 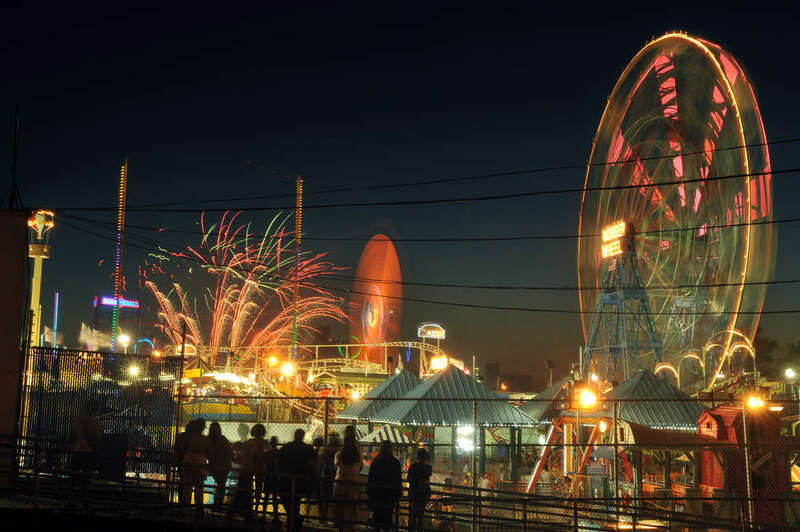 Pack a picnic, snag a spot on one of four piers, and marvel as the fireworks steal the show from parks beautiful skyline views. 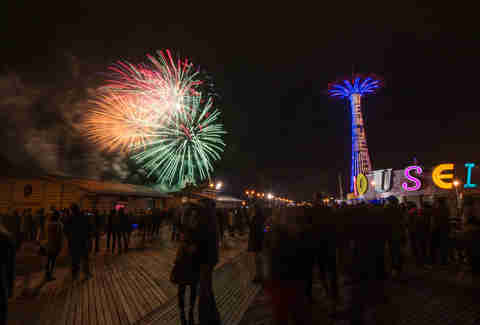 Coney Island puts on a free fireworks display every Friday during the summer, and the Fourth of July is its crown jewel. This beach gets better every year while holding onto its history. 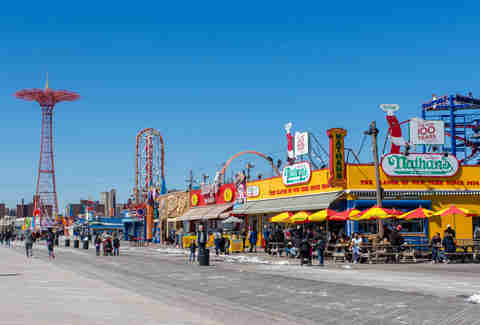 Grab a Nathan’s hot dog, take a spin on the Cyclone, and stay for the Coney Island Alliance’s 9:30pm show. You’re going to want to hit East River-facing rooftops for firework vantage points -- and Roof at Park South is on the lower end of the strip. Order festive fluorescent drinks (like blue mai tais), and munch on tacos and truffle fries while you gaze at the colorful, ear-splitting explosives. See with your eyes, not with your Instagram filter. If you’ve never partied at a heliport, that’s normal. You’re normal. But if for whatever reason helipartying has snuck its way onto your bucket list, here’s your chance. Make your way to the landing pad on East 34th Street for a front-row view of the light show. The ticketed spot comes complete with live music, a battery of food vendors, and of course, bars and beer tents. Tickets start at $60 and balloon from there. So book soon. Or, like, now. The Crown is one of those rooftops with crisp, cream-colored sofas that never seem to stain. The space is cozy and minimalist, with 360-degree views of Manhattan and, more importantly, the official Macy’s fireworks over the East River. General admission tickets get you a free cocktail and one hour of vodka open bar -- just don’t tip over the side before the show begins. 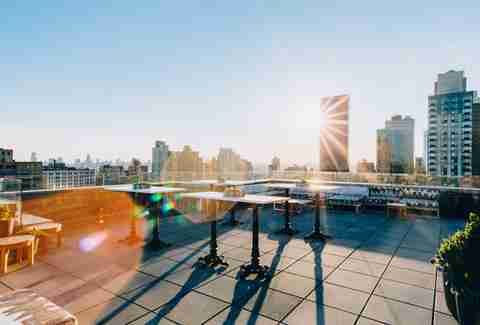 The Heights rooftop bar has plenty of tables for dining, and plenty of rooms for crashing at the Arlo NoMad hotel below. The rooftop bar is hosting a pregame from 2-5pm and a margarita open bar in the evening, so you can take in the fireworks and the Empire State Building from a safe distance, while sipping tequila like it’s Cinco de Mayo. You don’t need a rooftop to see the fireworks if you can finagle your way onto the East River. Take to the seas at the Brooklyn Barge Bar. Slightly spendy tickets start at $155 and include classic Fourth bites like burgers and dogs, plus guac, crudite, shrimp skewers, Mexican street corn, and Key lime pie. Eliza Dumais is the real All-American Girl. Follow her @elizadumais. The last firework display Ruby Anderson watched came from Katy Perry’s sparkly bra.